These are vintage glass cabochons that were made in Germany. They are semi translucent orange with a black line design hand painted on top. The design looks similar on each stone but they are a little different. These are set in raw brass prong set settings with one loop. The stones measure 18mm x 13mm. You will receive 2 pieces. Great as usual thank you! The photos are accurate...these are the most intensely orange, the juciest lush pendants, I've bought on-line in a while. 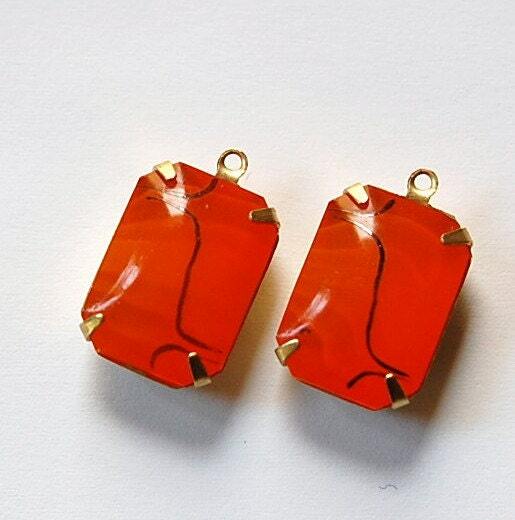 Perfect for a hit of colour in earrings. Thanks.